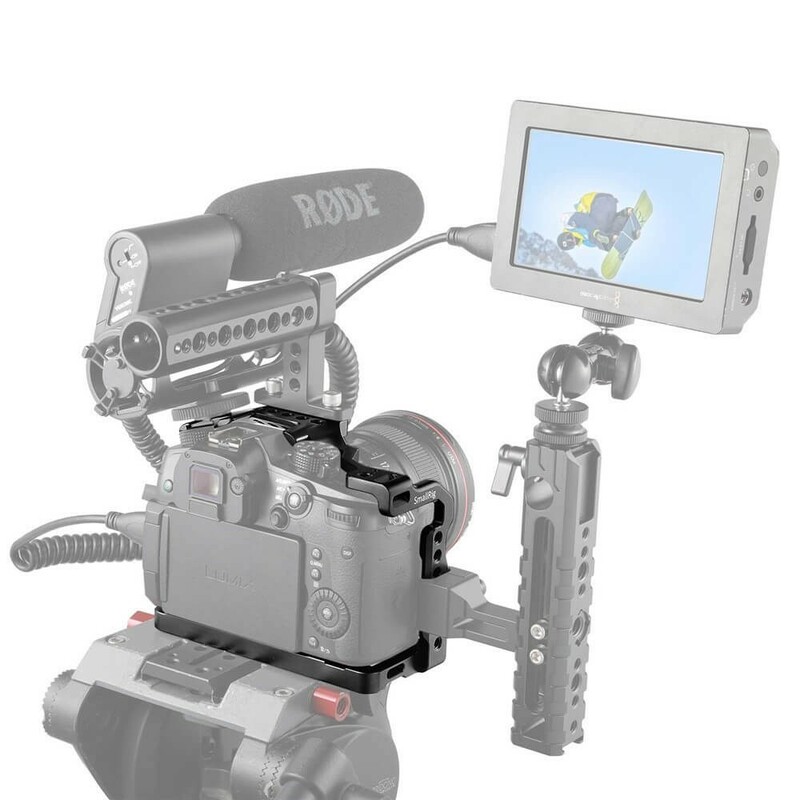 1.It does not block any access to the SD card slot, battery compartment, and all camera controls. 2.At the bottom are an abundance of multiple 1/4’’ and 3/8’’ threaded holes for Manfrotto and Vinten QR plates or Quick Release Baseplate Kit 2035. 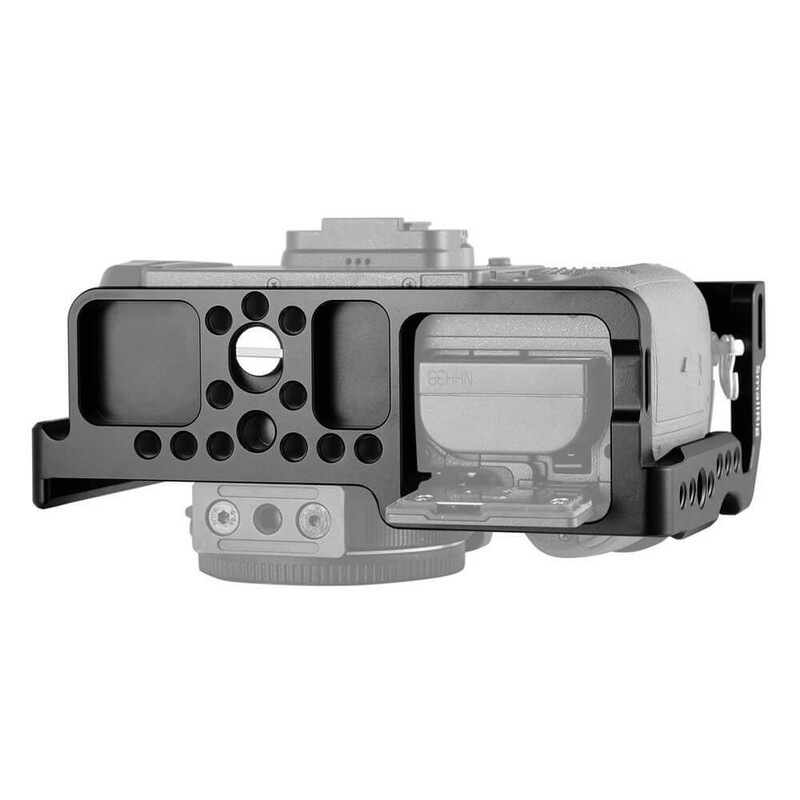 3.The cage is good for thermal dissipation of camera and prevents it from twisting. 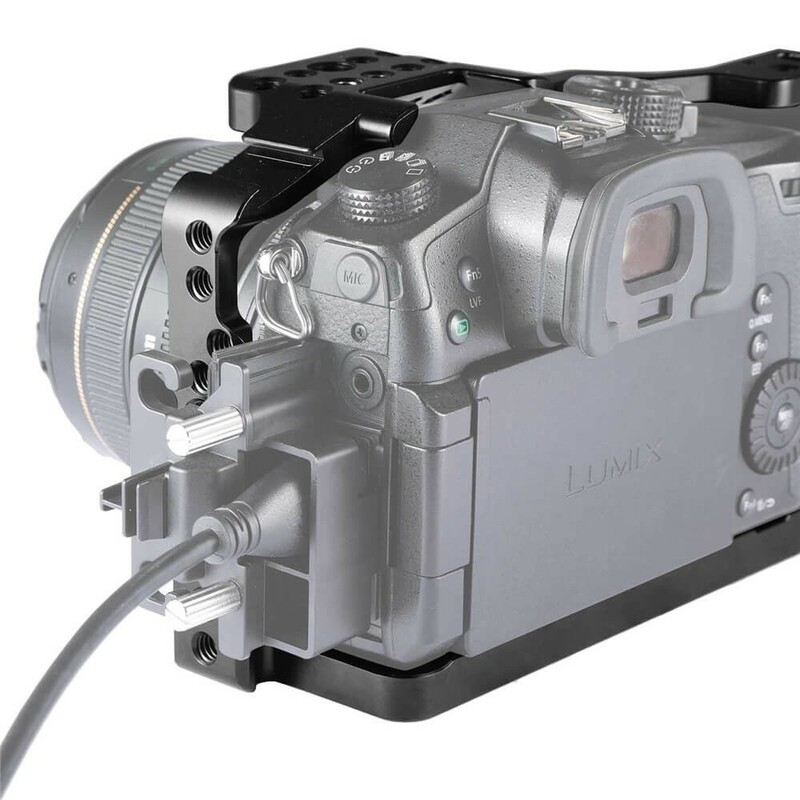 4.It could attach Panasonic Lumix GH5/GH5S DMW-XLR1 Helmet Kit 2017 on the top for handheld shooting and protection of XLR. 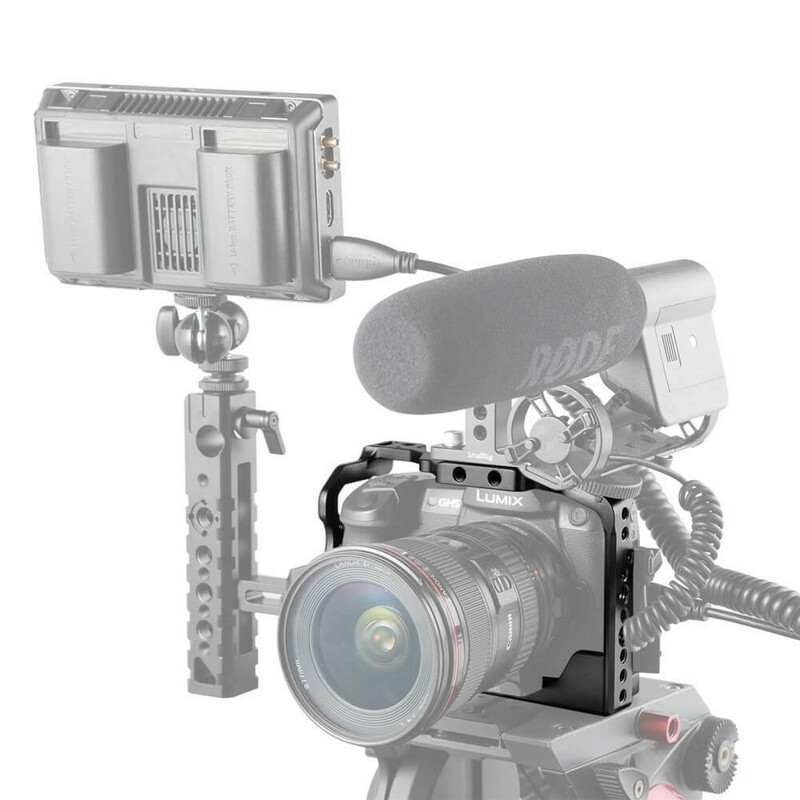 SmallRig Cage 2049 is designed specifically for Panasonic Lumix GH5/GH5S. 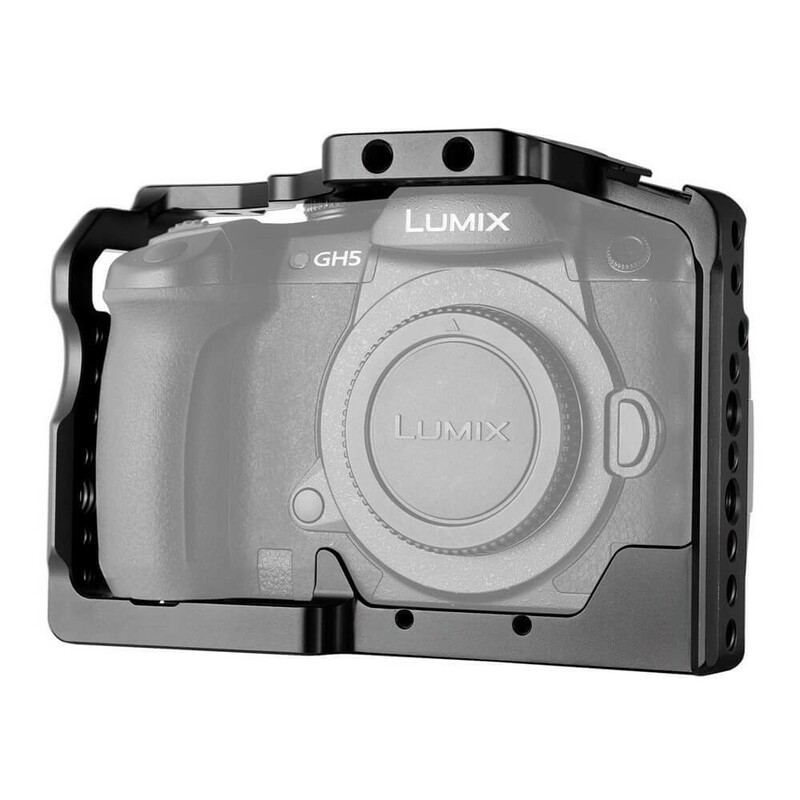 The GH5 cage benefits your Panasonic GH5 camera in video production by strengthening protection and stability and providing more mounting options. 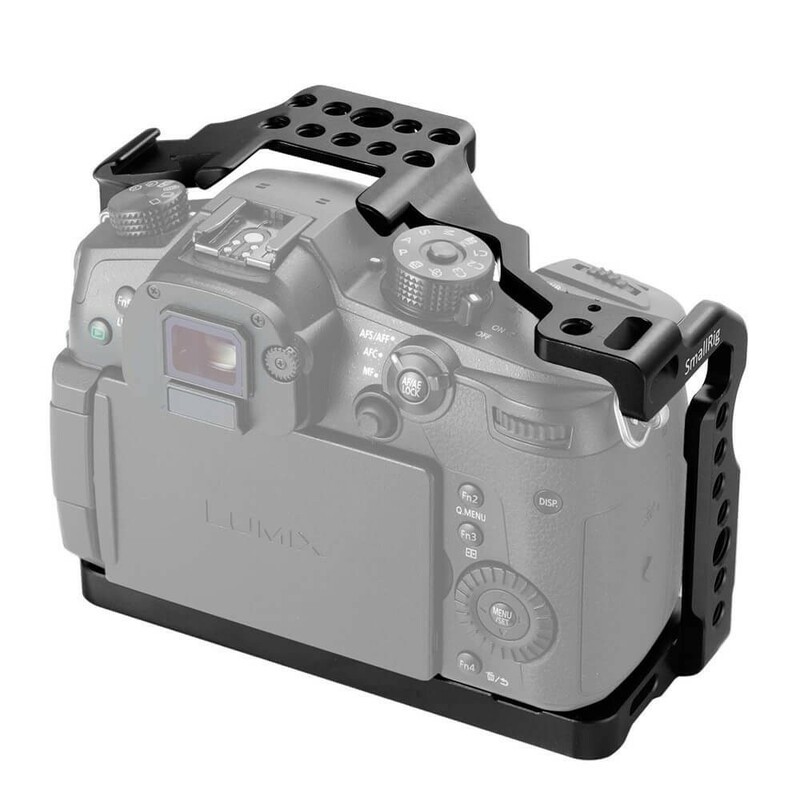 The cage fits the camera perfectly, and it does not block any access to the SD card slot, battery compartment, and all camera controls. It is equipped with an array of 1/4’’ threaded holes on the top for Top Handle 1984/1638. 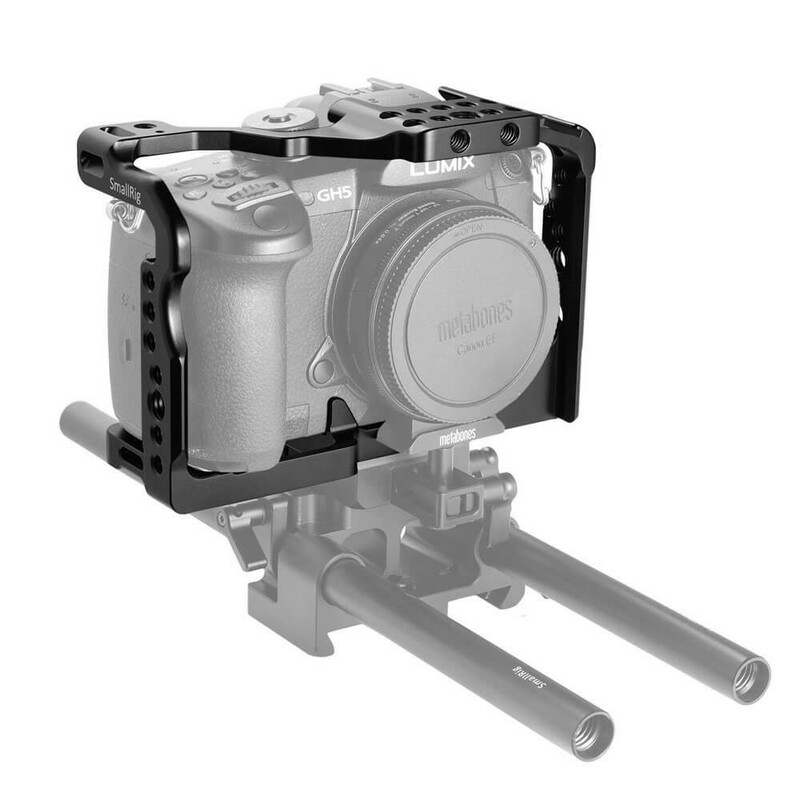 The integrated cold shoe on the top could attach microphone or accessories with cold shoe adapter. It features NATO rails on both sides for NATO handles to extend more mounting possibilities. Cold Shoe 1241 could be mounted on the cage via 1/4’’ and M2.5 threaded holes for microphone, LED lights and so on. NATO rails on the sides of cage could attach NATO Clamp to Arri Rosette 2046 and then Wooden Handgrip 1941 for quick release. HDMI Lock 1822 could be mounted on the side via 1/4’’ threaded hole for the protection of HDMI cable. At the bottom are an abundance of 1/4’’ and 3/8’’ threaded holes for Manfrotto and Vinten QR plates or Quick Release Baseplate Kit 2035. 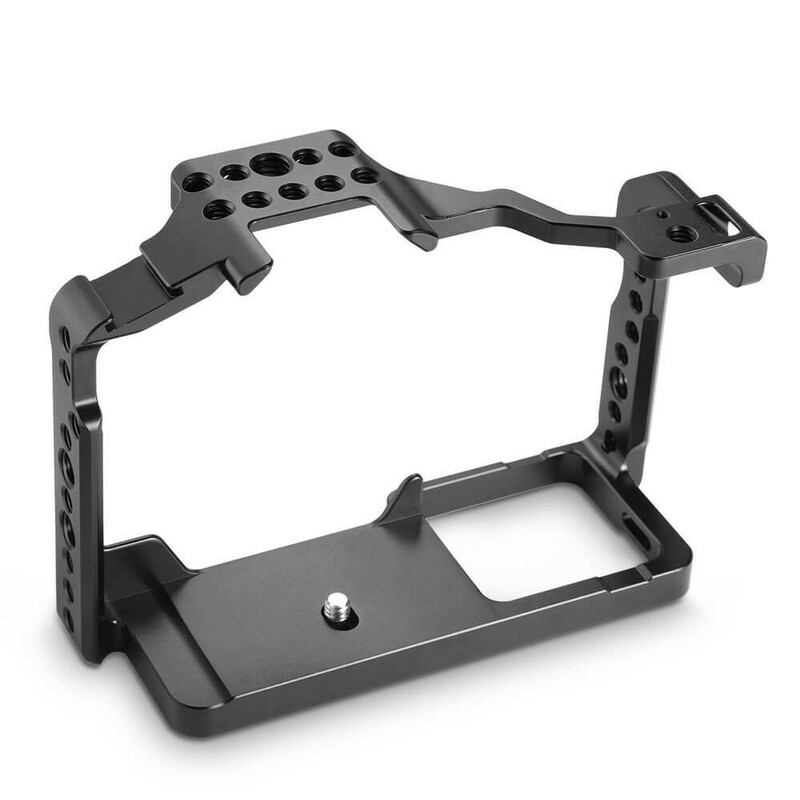 Lens Adapter Support 2016 could be mounted at the bottom of cage to support Metabones lens adapter. Additionally, on the right side of cage is an eyelet for wrist strap for your convenience. 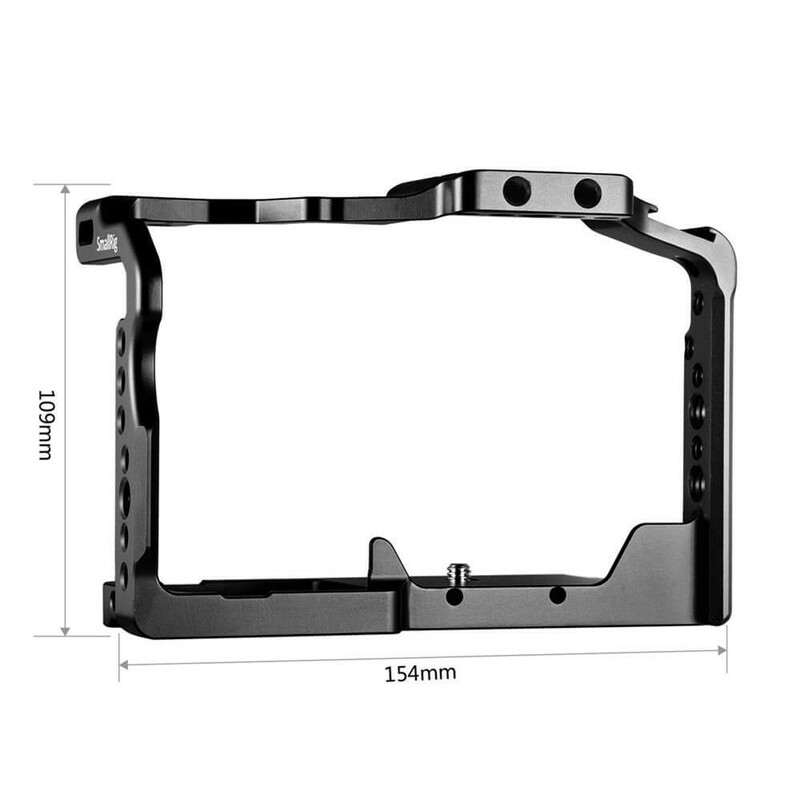 The cage is good for thermal dissipation of camera and prevents it from twisting. Apart from that, it could attach Panasonic Lumix GH5 DMW-XLR1 Helmet Kit 2017 on the top for handheld shooting and protection of XLR.